We'd like to have traditional pancake kitchen dinner Sunday night, but not if everyone's still hard at work! It's been a little while now since AVCon, I hope you all had a great time! We really enjoyed showing off some games from past jams, and we hope you enjoyed playing them! All the games from these past jams are Spotlighted in the games list (so if you're on desktop, you can see one of them at the bottom of the left sidebar right now! ), but if you're too keen to scroll over there, they're listed here as well! Rocket Reaction by Damon Pearce and Dan Beaumont was a multiplayer favourite at the Indie Games Room this year. This game was made for Adelaide Game Jam 2014 and features free-floating action (and deadly spikes). updownleftright by Andrew Dunn is a game made for Global Game Jam 2015 about rescuing astronauts and avoiding space debris. Cosplay Chase by Finn Stokes were both made for Ludum Dare 32. Boxed In was made by Dylan Browne at Adelaide Game Jam 2014. If you dig the idea of playing as a cardboard box escaping from a cardboard box factory, this one is for you! Recently, there's even an Android version on Google Play if you want to be able to play anywhere at any time. These were our featured games, but we also showed off a few older games. If you're looking for multi-player cooperation or competition, previous Adelaide Game Jams have you covered. If you're inspired to make a game, Adelaide Game Jam 2015 is coming up at the end of the month and we'd love to see you there! Ludum Dare 32 is coming up fast! 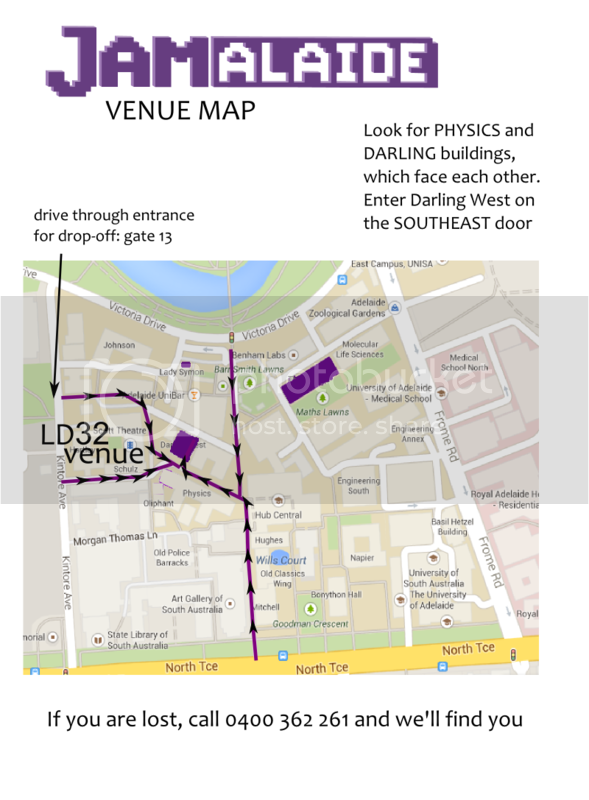 If you're keen to join us, check out our jam page for venue times and a handy map. If we get some clear weather Sunday, you might find us outside playing JS Joust. Hope to see you!